Respected American golf architect, Cabell B. Robinson, viewed being asked to design the 18 hole par 72 championship Praia D'El Rey golf course as the opportunity of a lifetime. 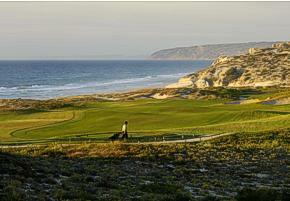 "This is the kind of landscape we architects try to create, but at Praia D'El Rey it's all here, naturally. Now it's my responsibility to protect it", he says modestly. It is certainly one of the most picturesque layouts in Europe, set in extensive grounds of pine forest and undulating dunes with spectacular views over the Atlantic and the Berlenga Islands beyond. 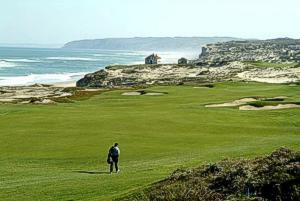 The course is visually stunning and tremendously exciting to play. Because of the endless variations of the terrain you'll never play it the same way twice. Cabell has designed the course to be the complete golfing challenge with bold deep bunkers, undulating greens, and natural sand border areas contrasting sharply with the lush green fairways. The ladies' tees are also far enough forward to make sure that length isn't a problem. Cabell feels very strongly that the course must be fun for everyone to play. Praia D'El Rey, rated 17th best course in Europe by Golf World magazine, has become one of the major golfing destinations in Europe. 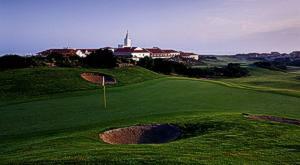 Not surprisingly, Praia D'El Rey has become a favourite destination for both private and sponsored events as well as international tournaments.